Stoke chairman Peter Coates is "delighted" with the impact made by Giannelli Imbula, having watched the player for a long time before his club-record £18.3m transfer from Porto. Imbula, 23, scored his first goal since his deadline day move in the Potters' 3-1 win at Bournemouth on Saturday. 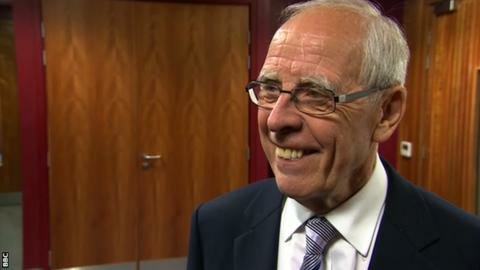 "I always pray it's going to work, because you never know," Coates, 78, told BBC Radio Stoke. "He was well looked at before we did anything. We did a lot of homework." Coates is now confident the Belgium-born former France Under-21 midfielder can go from strength to strength in the Premier League. "We are delighted with the start he's made. He's had two good games and to come in and start like that, we're very encouraged," Coates said. "It's a key position and he's a key player. And we're keeping our fingers crossed it'll work out well for everybody." Would Stoke spend big again? Imbula's arrival saw Stoke break their transfer record for the second successive transfer window, following the signing of Xherdan Shaqiri for £12m in August. But Coates is staying quiet about whether he would be tempted to spend big again in the summer. "I'm not going to forecast what we might do," he said. "You don't get too far ahead of yourself, you proceed with caution. "It's different when you've got responsibility for big sums of money - you don't want to make mistakes. Sometimes clubs spend £50m and it still doesn't work out." Having finished ninth in the Premier League in each of the last two seasons, Coates is hoping 10th-placed Stoke, having narrowly missed reaching the League Cup final, can finish the season strongly once again. "I never say where we're going to finish," he added. "We're working hard trying to get better. "We've had a good cup run getting to the semi-finals, which was a great achievement - we were very unfortunate to go out (at Liverpool). "With the season as a whole, we've got to be pretty pleased. Our points position is probably about where we expect to be, hopefully we can have a good run-in."